If all else fails, Reset your Router, Google Netgear Router Reset for that. If unable to access Configuration page at any point, see Manually Configure LAN Connection (at bottom of page ). Instructions will be divided into three sections. Open and leave this open, We will be referencing and checking the connection often. 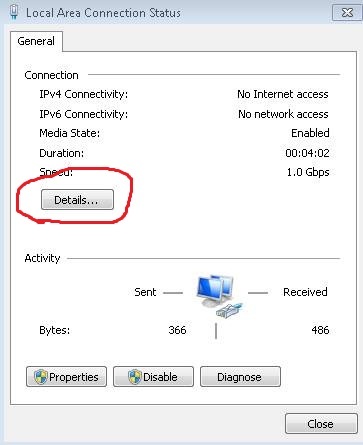 You can check the detail status of your network connection, look for IPv4 Default Gateway, This should be your Routers default log in page. A pop up window should appear asking for user name a password. 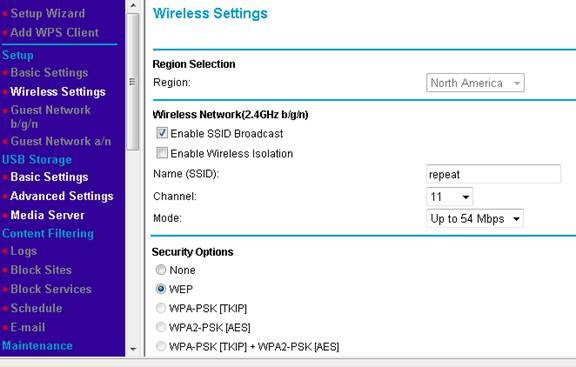 You should see picture below, The left Side in Blue is the Navigation, Select "Wireless Settings"
Do not select "Enable Wireless Isolation"
Go to "Advanced -> LAN Setup"
End of Router 1, Base Station: MBRN3000 Set up…. For repeating the Mode must be the same as the base "Mode Up to 54 Mbps"
The Wireless Settings a/n Mode can remain enabled on this device while repeating the Wireless b/g mode. 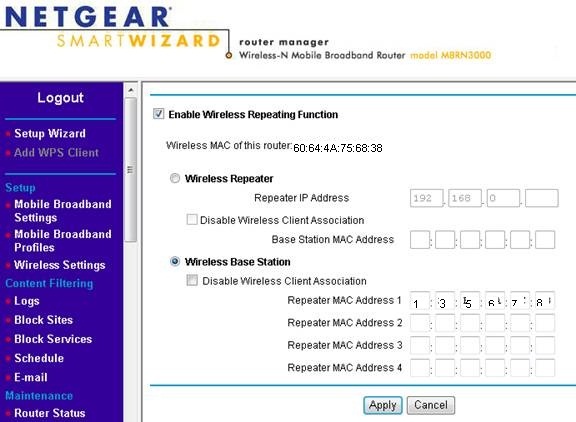 Select "Enable Wireless Repeating Function"
For this to communicate with your Network, the Default Gateway must be the same, to achieve this do the following. Attempt to connect to set up. 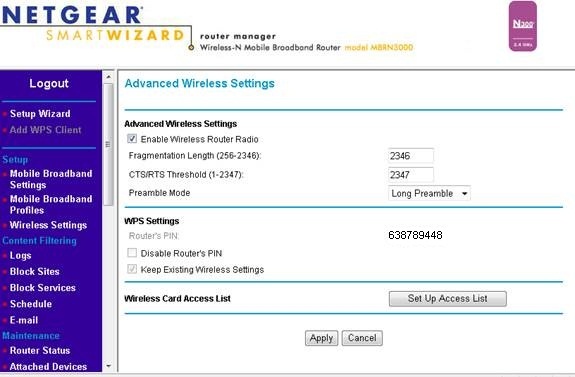 To test if there is a connection, Disable the PC Wireless Card, use a Wire LAN cable attached to Repeater Router 2 WNDR3700 . 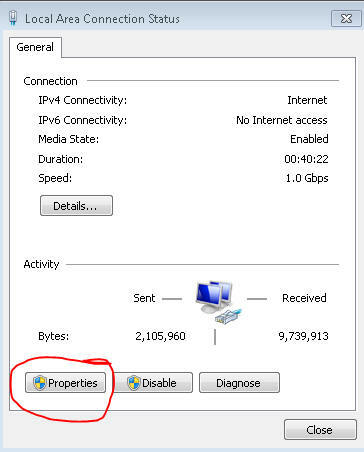 If the PC has an internet Connection the routers are communicating. Give a few minutes for both routers to communicate, if they do not communicate, turn off both routers, then Power On Router One, then Power On Router Two. 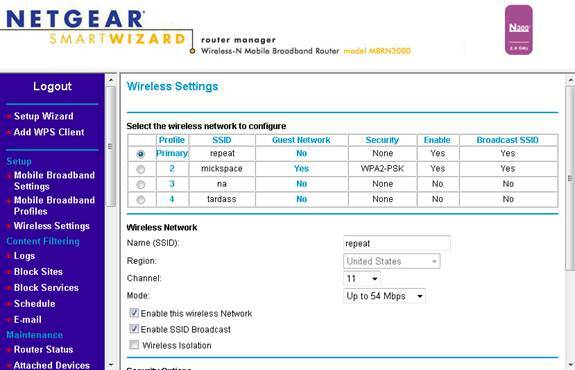 For Example, my primary reason for this set up, I want a device with only a Wired LAN connection available on the Device, I set up Repeating router, then move repeating router near the Wired LAN device, connect Wired LAN Device to repeat router. I don’t have to run a CAT 6 or 5e cable around the house. 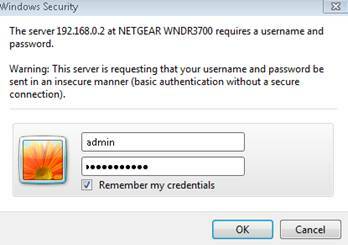 Thou I have no password to connect to the repeat SSID, if the device is not on the Access List it will not be able to connect, The base router 1 handles all access controls, and addressing. 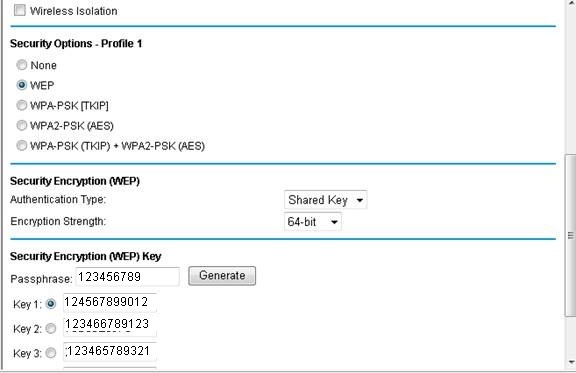 The down side to this set up is if a new device needs access, I have to disable the access list, then allow the device to connect and add the device MAC address to the list, then re-enable the Access List or go into the access list and manually add the MAC address of the device, this is fine if you rarely have any new devices connecting. This defeats the Wireless Repeating, This method will extend the network for the distance of the cable used. This set up has its advantages. This requires a LAN Cable. ( it is possible to use a LAN POWERLINE rather than run a Cat 6 or 5e cable, Thou I have never used one? 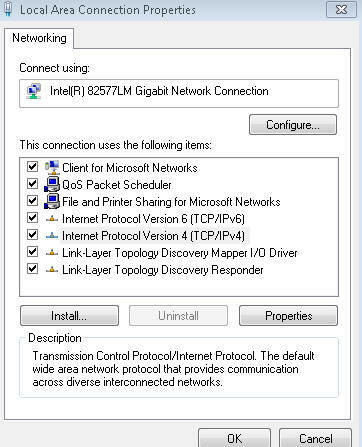 Set the LAN shown in Step 2 and Step 6 This will allow your routers to communicate on the same network. The important part here is the Channels which are broadcasting. Broadcasting SSID must be on separate Channels. Connect Wired LAN Cable to both routers ports ( I use Port 2 or a middle port ) on the second router do not choose the incoming Internet port, choose a regular LAN port. Power Off the Second router, Power back on wait a few minutes..
One can use a LAN Crossover Cable to connect the two routers, that is a different story, the general public does not have a handy crossover cable or the equipment to make a crossover cable. This will create Two different Networks, The First Router will assign the Second an IP address, the second router LAN IP set up will have to be set to a different setting, i.e. 192.168.1.1 rather than 192.168.0.2 creating Different networks, otherwise attempting to set the both routers to use the same default gateway will result in a conflict. 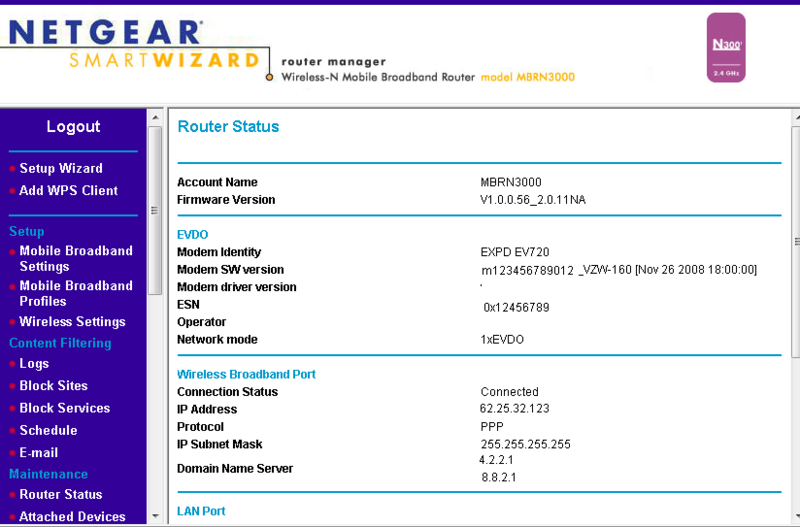 The WNDR3700will reset it self to use 192.168.1.1. The above instructions using a regular LAN cable works better if you want everything segmented to the same network. This works great in my house as I have both routers on either end of the house, one up stairs one down stairs, I did have to run a very long Lan Cable to accomplish this, Every thing is on the same network and accessible to the whole network. 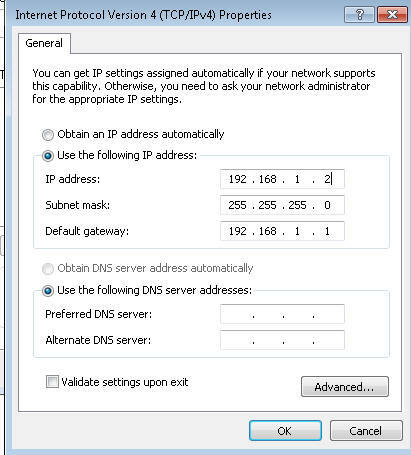 Select "Internet Protocol Version 4 (TCP/IPv4)"
Manually enter the IP Address assignment as follows. 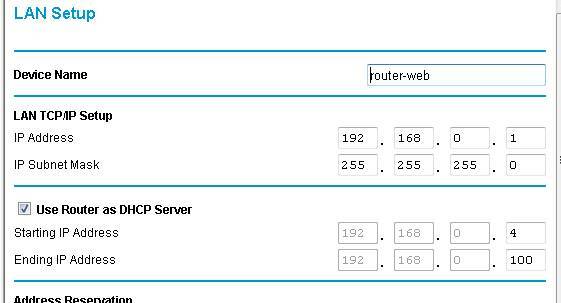 If this does not work, power off the router, power back on the router, try accessing the configuration page again. Once the Router can obtain IP Addressing ( after adjusting the LAN Setup ) come back to this and select "Obtain IP Address Automatically"